Image: Jonny de Jong, 30, owns the milk processing plant at his parents’ organic dairy farm, Working Cows Dairy. His mother, Rinske, 57, also produces Gouda cheese under the label Rinske’s Cheeses. 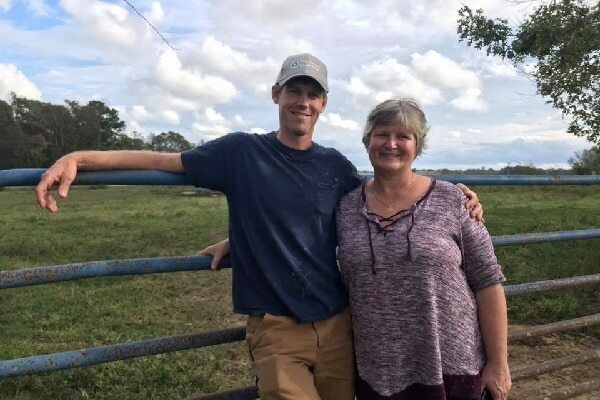 At 30, Jonny de Jong is lanky and lopes briskly from the small farm office he shares with his mom to the milk processing plant he owns on his parents’ dairy farm. As he walks, he passes dozens of mixed-breed cows behind fences. Jack, the stray dog the family adopted when he walked up to the farm from State Highway 103 a few years ago, jostles behind him. Working Cows Dairy, Alabama’s first and only certified organic milk farm, is a grazing dairy and on this visit the cows are readying for winter. This means the cows are fed no grain whatsoever and instead eat a variety of hay and haylage or stored grasses. Jonny lives on the farm with his wife, who also serves as the plant’s bookkeeper, and their toddler daughter. Running a family dairy farm, organic or not, is a rarity these days. It takes about 30 minutes to drive west from downtown Dothan on gently rolling two-lane roads through farmland and small communities to reach Working Cows Dairy, which sits close to the Houston-Geneva County line in Slocomb, Alabama. The land is surrounded mostly by row crop farms, where for generations folks have planted peanuts and cotton. Jonny’s parents, Jan and Rinske de Jong settled on this 450-acre spot in 1991 with their three sons. Jonny is the oldest. Jonny’s father, Jan, grew up on a dairy farm in Fryslan, a coastal region along the North Sea in what is now the Netherlands and some of northwestern Germany. In 1985 Jan and Rinske immigrated to the United States with $5,000 in savings and a dream of starting their own dairy farm. The couple spent a few years working as dairy farmers in the Florida Panhandle before settling in Lower Alabama. For more than a decade, the de Jong family ran a commercial dairy. At its peak, Working Cows Dairy was milking 750 cows, three times a day, with a staff of 16. It was not the life the de Jongs had imagined for themselves—supervising so many employees and trying to unload thousands of gallons of milk per week, every week of the year, all while dependent on the fluctuations of milk processors’ prices. “The roller coaster from the milk prices made us rethink what we were doing,” Rinske said. A severe drop in milk prices, destabilizing federal farm policies, and the increasing costs of feed and fuel, have made it nearly impossible for small dairy farms to operate. Levi Russell, associate professor of economics and finance at Ottawa University in Ottawa, Kansas, explains. In 2006, the de Jongs decided the only way to remain financially viable was to become a certified organic farm. The process of going organic is neither fast nor cheap. It takes about three years and a considerable monetary investment. The de Jongs had to plant their grazing fields with non-GMO seeds and each acre of land had to be transitioned to organic by using manure instead of synthetic fertilizers for 36 months. The cows, too, had to become certified by being fed 100 percent organic feed and also be treated with organic “medicine,” that is, herbal medications such as garlic tinctures, and no antibiotics. Once the family farm went organic, the de Jongs realized they also needed to produce their own milk. Producing one’s own milk puts more control back into farmers’ hands, enabling them to bypass milk processors and the unpredictable, but generally low, prices they pay. This decision prompted Jonny to leave his mechanical engineering studies at Auburn University and invest in the processing plant. The family spent hundreds of thousands of dollars to set up its plant and purchase a truck to transport milk to customers. Now the farm sells the raw milk to Jonny, whose plant produces minimally processed cream-top whole, two-percent, skim, and chocolate milk, and heavy whipping cream. The final products are then sold on-site, and also directly to schools, restaurants, and retailers such as Whole Foods in Birmingham, Mobile, and Montgomery. At Working Cows Dairy, the amount of organic milk the herd produces varies with the seasons. In the winter, the herd produces about 200 gallons a day. Then from February to May, the cows produce about 450 gallons a day. In the spring of 2017, with milk plentiful, Rinske decided to begin producing six types of raw-milk cheeses under the label Rinske’s Cheese. Most of the cheese is sold at Working Cows Farm. While Working Cows Dairy produces less milk than it did as a traditional commercial dairy, its profit margins are higher, thus enabling the family to stay in business. A gallon of Working Cows Dairy milk retails for $8.39 per gallon plus tax at Whole Foods. “We have a very premium market and a very low volume,” Jonny said. In addition to producing organic milk, what’s kept Working Cows Dairy in business is that Jan, now 60, no longer works at the farm. Instead, he supplements the farm’s income by doing “dirt work,” that is site work and excavation services for chicken farms and other commercial businesses. Russell said families like the de Jongs are on the right track. Small and medium-sized dairies will have to carve a niche in an increasingly chaotic open market. “It’s creating a need for them to differentiate, in some sense, or to find other lines of production,” Russell said. Still, American Dairy Association of Alabama President Traylor worries that farmers bottling their own milk is not a sustainable trend and that the “new” appeal will wear off. Most consumers “just want to get a gallon of milk where it’s cheapest at” Traylor said. Back at her office, between fielding phone calls from vendors, Rinske, now 57, reflects on what has let her family thrive under difficult economic conditions. She says that several years ago, the USDA was making dire predictions. “[The USDA] were already saying by the year 2020 there wasn’t going to be a dairy farm in Alabama,” Rinske said. The decision to produce organic milk has made sense both financially and environmentally. “We wanted to go back more to what nature intended,” Rinske said. Have you ever visited an Alabama dairy? Tell us in the comments.